This delicate circular charm encasing a radiant iridescent stone signifies a daughter's infinite love. 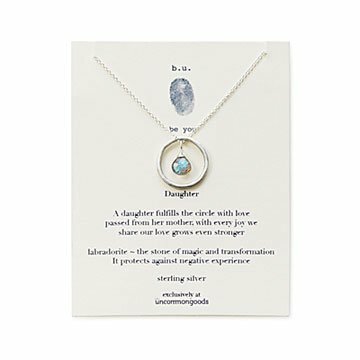 Show your daughter your love for her is endless with Mary Steratore's delicate circular pendant, which subtly signifies such an infinite bond. An iridescent labradorite stone dangles within it, and the necklace is packaged with an insert card celebrating the ever-growing strength of that bond. Compliment this piece with Mary's Ring of Love necklace designed for mothers. Handmade in Pittsburgh, Pennsylvania. Card reads: "A daughter fulfills the circle with love passed from her mother, with every joy we share our love grows even stronger. Labradorite - the stone of magic and transformation. It is said to protect against negative experience. Every thing about it I loved. Very happy I found it and my daughter loves it. Beautiful. A special necklace that I will eventually give to my daughter in a few years. I am currently filling it with my love. Customer service was awesome as I did not receive my original shipment and they resent it. It was my first time ordering from you and I will definitely do it again. Good quality...happy with the purchase. This was a perfect gift for my daughter in law. Renea's husband (our son) retires from the Air Force, May 23. They have both been the military 20+ years together. I bought this necklace as a gift to remind her that my son couldn't have done this without her support. Also that even though her mom passed away recently, I will be her Earth mom and she will be my daughter. I purchased two circle of life nesting ring necklaces for their two girls for their sacrifice and support of their parents. Renea teaches at the Air Force Academy- has her PhD and is a great mom, wife and daughter. This necklace is delicate and beautiful- I know she will wear it always. The message printed on the card was so perfect that I thought it was meant for her. I thank them for their service and also thank them for my 3 grandchildren, loving marriage and their love for us. My daughter loved this special necklace. It is a symbol of the love we have for our daughter. I couldn't be more pleased with these necklaces. I wear it every day thinking of my mom. It was a great idea but when she finally showed it to me around her neck at thanksgiving, it had turned grey. I was embarrassed for having bought her something so cheap.